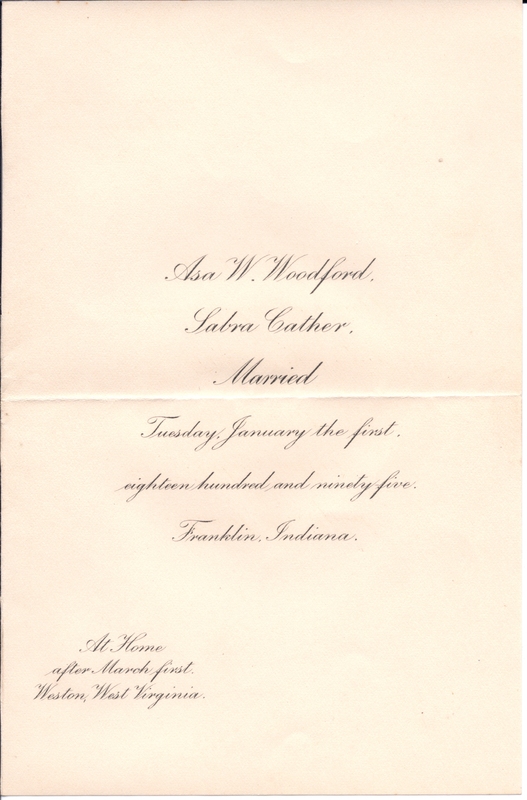 Marriage Announcement 1895, Asa Woodford & Sabra Cather. Sabra Cather is the sister of my 2nd great-grandmother. She was born in West Virginia in 1859 and moved to Ohio with her family . She was an art teacher at Vincennes University and in 1895 she married a widower in Franklin, Indiana. I have no idea what took them to Franklin. They returned to Asa’s home in West Virginia where he raised cattle. Sabra and Asa had no children. By 1910 Sabra is living in Los Angeles and is listed as divorced, Asa is living in West Virginia and is listed as widowed. Sabra was an accomplished artist. I had no idea that a painting hanging in my parents’ house for years was hers!